Prize-Winning 2010 GL1800 .........NOW SOLD! Having recently retired, I have decided to treat myself to a newer Wing — so my prize-winning 2010 GL1800 is now reluctantly for sale. I bought it new from Knutsford Honda on 1-Sep-2010, so it has only had one owner. It's a US-spec (always more complete than the UK-spec) and has done 49k miles (averaging 6k miles/year, partly from several brilliant European tours). It does not have the error-prone built-in Honda SatNav or the currently-being-recalled Airbag (I wisely didn't want them! ), but it does have the excellent ABS. No expense has been spared and it has a full service history at HONDA MAIN DEALERS - it was last serviced on 23-Aug-18 at Colwyn Bay Honda, where it also passed its MOT test on the same day (so it is MOT'd until 1-Sep-19). 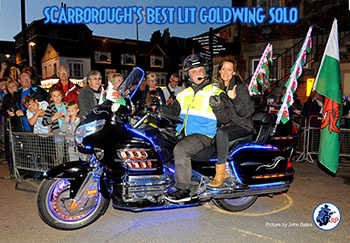 It has won Best Lit Bike awards at 5 different shows! 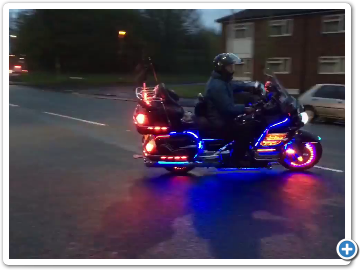 Unlike some brightly-lit Wings which have LED strips distractingly visible all over the bike when the lights are off, my own bike has been complimented numerous times on the discreet way the lights have been camouflaged. Numerous large photos of the bike can be found in a special photo gallery on this site. Here are a couple of brief videos of the bike. The first is at night in normal-running mode (with my wife on her Spyder which I have also lit up). PARADE mode is even better though, thanks to the strobes and Knightriders! The second video shows how it looks in the daytime. 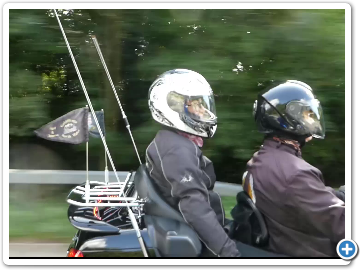 I will retain the private plate (B16 WNG) for my new bike, along with a small number of other items (mainly the interconnected Autocom intercom/PMR system/Garmin Zumo SatNav), but you can find below a list of the SIXTY-THREE accessories it IS being sold with. As you can see, they cost me over £7,000 in parts alone (fitting costs would double that). …….and probably others I have forgotten about! The sale price for this outstanding machine is just £12,950! Contact Nigel Mackintosh on 077-1957-1963 or via email.